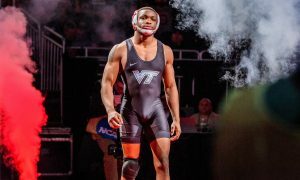 One of the more difficult decisions of the entire All-2000’s series was here at 125 lbs. 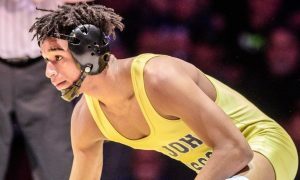 We’re going with Angel Escobedo based on the fact that he is the first and only four-time All-American in school history, his three Big Ten titles, and two Midlands crowns. Though he never finished lower than fifth at the NCAA Championships, Angel was hampered by shoulder injuries through his last three years in college. 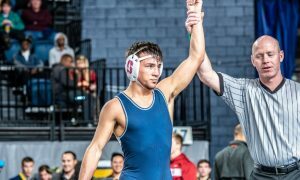 Escobedo’s cousin Andrae Hernandez makes the cut at 133 lbs on the strength of a career that saw him qualify for the NCAA Championships three times, highlighted by an eighth-place finish in 2007. Hernandez’s trek through the 2007 NCAA consolations saw him knock off future multiple time All-Americans Joe Baker (Navy) and Jimmy Kennedy (Illinois). An All-American season as a senior in 2003-04 saw Coyte run his career record up to 123-36 with 37 falls. That number was good enough to place him third on the Hoosier’s all-time pins list, at the time. He was also only the second Indiana wrestler to qualify for nationals in all four seasons. In each of his final three seasons in Bloomington, Cooper earned a top-12 seed at the NCAA Championships. A big in-state recruit for the Hoosier, Matt Coughlin came right out of the chute and got onto the podium as a freshman. 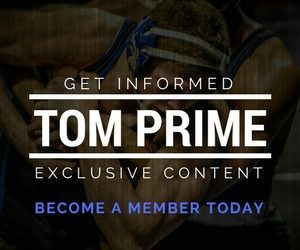 At that tournament, in 2007, Coughlin racked up wins over the second-seeded Matt Storniolo (Oklahoma), fourth-seeded Jordan Leen (Cornell), and twelfth-seed Dan Vallimont (Penn State). Matt would go on to qualify for nationals the next year at 165, before dealing with a variety of injuries for the remainder of his career. Brandon Becker is one of only six wrestlers to earn All-American honors three times for Indiana. 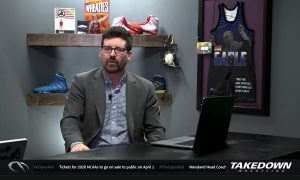 After coming into nationals in 2005 as an unseeded freshman and falling in the first round, Becker reeled off five straight wins and put himself in position to wrestle for fifth-place. His Round of 12 victory that season came at the expense of top-seeded Alex Tirapelle (Illinois) 8-7. 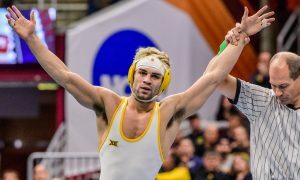 Always one of the most dangerous and exciting wrestlers to watch, Taylor Walsh was finally able to break through in a big way his senior season when he made the NCAA finals. For the first three years of his career, Walsh was a mainstay in the rankings, but never won more than a match at nationals. Taylor finished his career as the school’s leader for pins in a season (26) and a career (69). The next most prolific pinner for the Hoosier tallied 47 for his career. 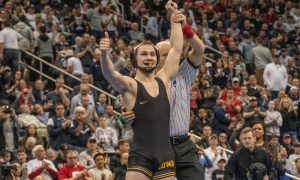 The 2015-16 season, Nate Jackson’s first All-American campaign, saw him hand upstart freshman Bo Nickal his first career lost 7-6 in a dual meet. 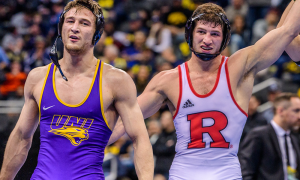 The pair would meet again in the NCAA Semifinals, and Nickal avoided the upset with a 4-3 victory. Jackson got onto the podium for the second in 2016 when he became the sixth wrestler in school history to become an AA at two different weight. He was also the first multiple-time All-American since Escobedo’s graduation in 2010. The title of the Hoosier’s all-time wins leader belongs to Viktor Sveda with 149 against only 28 losses. Sveda two All-American’s seasons came in his freshman and junior years. 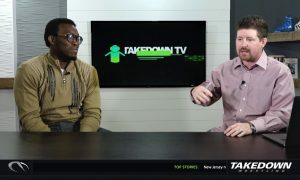 The other two seasons saw him get eliminated in the Round of 12. Upon completion of his career, Viktor was the Hoosiers all-time leader in falls with 47, a mark that was broken by Walsh. In his first two trips to the NCAA Championships, Pat DeGain came up a match shy of earning All-American honors at 197 lbs. 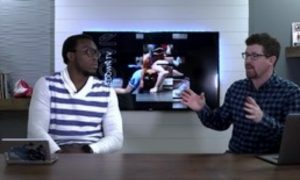 He bumped up to wrestle as an undersized heavyweight, as a senior and ended up taking third in the country. 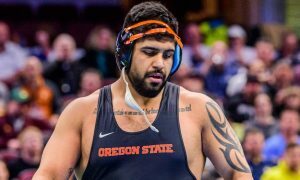 DeGain finished behind a pair of two-time NCAA Champions, Steve Mocco (Oklahoma State), and Cole Konrad (Minnesota), and just ahead of two excellent heavyweights in Greg Wagner (Michigan) and Cain Velasquez (Arizona State).